Giving young people access to the things they need to make art can do two very good things: help them navigate the present and provide them options for a future as a professional artist. But both can require them to get out of their comfort zones. Many adolescents and young adults can’t actually picture themselves building a career in music, dance or writing, especially if they come from backgrounds where they’re not exposed to the kinds of professionals who have traditionally been able to make a living at their art, like symphony orchestra players, ballet dancers or opera singers. 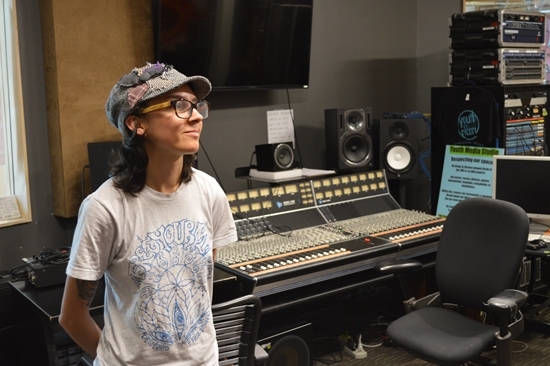 Mona Magno is a musician and fellow at Youth on Record. She plays the ukulele and coordinates YOR's female-only FEMpowered program. Photos by Daniel Tseng. The evidence is all around them, of course, painters, poets and performers of all stripes have all carved out niches in the work world. So have sound engineers, producers, publishers and other behind-the-scenes types. 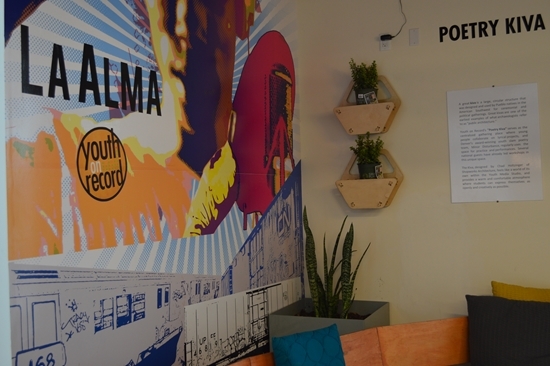 “Artists can sustain themselves with their art — and that’s real,” said Jesus Rodriguez, program director at Youth on Record. 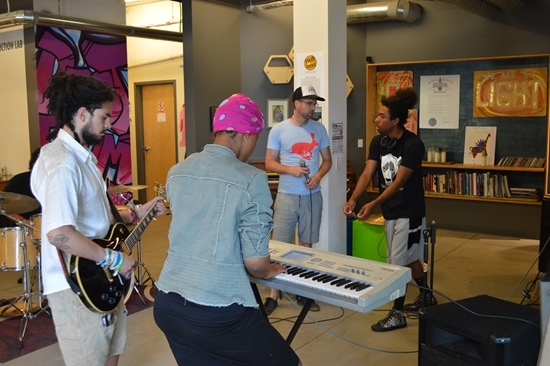 The Denver nonprofit introduces people, ages 14-20, to the many possibilities of music and other art forms through a variety of programs, working in schools and residential treatment centers to keep folks engaged with their education, hosting casual, free-flowing open labs at its headquarters on West 10th Avenue, providing extended fellowships to would-be creatives between their secondary education and whatever comes next. In-school, after-school, around-school, YOR meets them on their own terms. 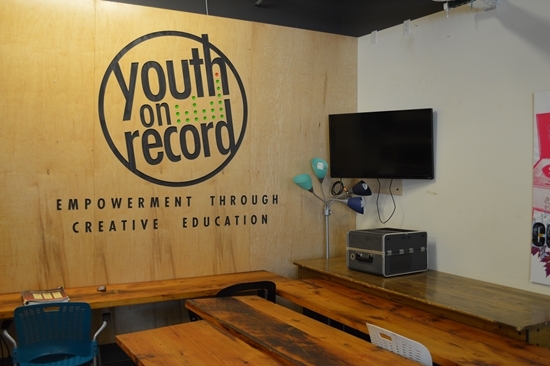 Youth on Record helps young people see the possibilities of music as a career, through mentoring and by giving them access to equipment.Photos by Daniel Tseng. For many young people, that other, more immediate good thing happens as they gain access to YOR’s equipment-filled studios and receive coaching from actual pros in the business: They connect with goal-oriented peers, they gain confidence and validation and learn to express themselves, they have fun. Those experiences happen everyday at YOR and they provide a setting for the upcoming IdeaLab, titled Why Art? Why You? Why Now?. The June 13 event is a free, youth-only summit meant to support creative development, cultivate new connections and spotlight creative leadership. YOR is the setting for a youth-only IdeaLab June 13. The afternoon-long lab starts with panel discussions, moves into breakout sessions where participants in the areas of music, poetry, dance and visual arts work with mentors, and culminates in group sharing of the work created. Registration is required (if you want to nominate someone — or yourself — to attend there’s info at the end of this story), but everyone, ages 14-20, is invited. The event is structured, but geared so that all participants have their own unique experience. “I expect students will show up a little bit shy and leave feeling a sense of purpose in their art,” Magno said. YOR students get mentoring from successful, professional artists in the community. Photos by Daniel Tseng. Youth on Records students all arrive with their own histories. Many are from minority communities and many are economically disadvantaged. The majority live in families that qualify for Colorado’s financial-assistance programs. “A lot of the students we serve have experienced trauma in their lives, they haven’t been prioritized culturally,” said Magno. YOR defines art broadly. Students focus on music, poetry, dance and more. They might learn to create beats or explore sound technology. “We assist our students in turning their turmoil or their stress — or their excitement — into art,” she says. 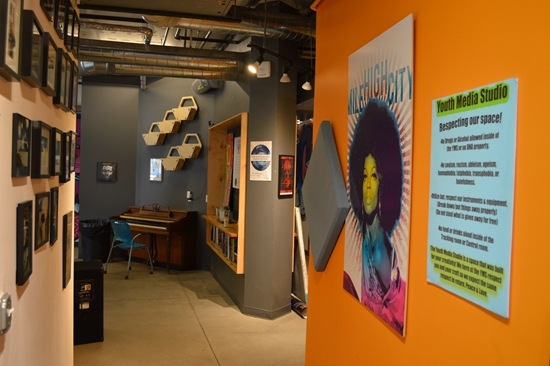 Part of that is by providing “a safe space where they can let their guard down,” said Rodriguez, and record their experiences, via art, in a way that can be shared with the community around them. And YOR has a broad definition of art — everything from composing music, to writing lyrics and poetry, choreographing movement, creating beats and visual experiences, producing other artists and more. And to evolve personally or professionally, long-term through one of YOR’s many offerings or for an afternoon, through an event such as IdeaLab. IdeaLab: Why Art? Why You? Why Now? Takes place noon to 4 p.m. June 13 at Youth on Record, 1301 W. 10th Ave., Denver. To nominate a young person or to participate or to sign up yourself, click here. IdeaLab is a partnership with Youth on Record, Confluence Denver and Creative Exchange, with support from the Bonfils-Stanton Foundation.